ORS and its professional team persuaded the Local Authority to include this 145 acre site in their Deposit Plan, the site having been omitted from the Consultation Draft. ORS further persuaded the Authority to grant planning permission ahead of the Local Plan Inspector's Report. 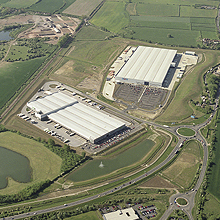 The whole site was sold to Gazeley Properties Ltd and is now occupied by a 360,000 sq ft ASDA warehouse and a 700,000 sq ft ARGOS warehouse, leaving enough land for the last unit of 430,000 sq ft.